In April of 2009, Mike Metlay launched the latest of his mindSpiral collaborative projects. This version, the eighth incarnation so far, was a trio composed of David Herpich (better known as Emerald Adrift), Darrell Burgan (better known as Palancar), and of course Mike himself. The central purpose of this version of mindSpiral was to compose and rehearse music for a live performance taking place at the Fiske Planetarium in Boulder, Colorado, on April 11, 2009. However, when you put three experienced improvisational electronic musicians together in a room, all of whom are DJs on the StillStream.com net radio station, and all of whom are very much used to playing live on air, it is inevitable that at some point the rehearsal process would be set aside so they could just play together for fun and inspiration, with an online audience following the action. So it was that on April 7 and 10, 2009, David, Mike, and Darrell played two hour-long live improvisations on StillStream.com, and on April 12, the morning after the successful planetarium show, they played a third hour on Second Life, before going their separate ways. The artists felt the music from all three of these sessions was remarkably inspired and focused, and upon relistening over the summer, they determined that there was enough material here for at least two releases, not to mention the recordings of the music for the planetarium show (whose ultimate fate is still some ways in the future). The process was fairly straightfoward. The jam sessions were carefully listened to, and then chopped into smaller pieces where there were obvious break points. Selections from that list of tracks were then ordered into releasable sets with a common theme or feel. 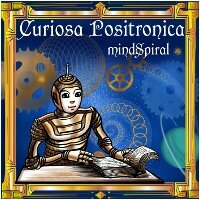 The first of those releases is this album, entitled Curiosa Positronica. The idea for the title came from the divergent and often thought-provoking moods of the pieces collected for the release. Taken as a whole, these ten songs give the impression of a robot from some future (past?) time, poring over ancient manuscripts in a passionate attempt to understand how human beings think ... or thought. By turns sad, arresting, and whimsical, this extraordinary collection of music belies the fact that it was all performed live with no rehearsals or preparation. Earth Mantra is excited to be able to bring you this first glimpse into the colorful, mournful, amusing world of mind8Spiral.